Update (11:00 am ET): During their joint press conference, Trump offered effusive praise of Haley, saying she earned the respect of foreign diplomats during her time as UN ambassador. He added that "maybe" she will be coming back at some point, and that she could have "her pick" of jobs in the administration. 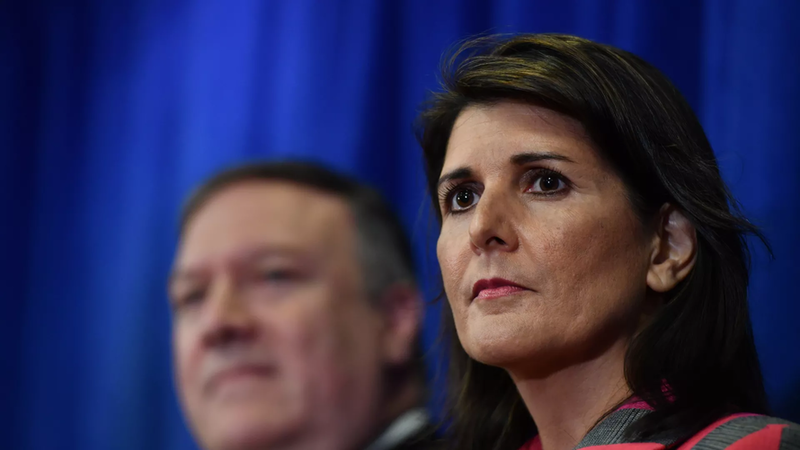 When her turn came, Haley praised the administration's "follow-through" on its foreign policy aims and her success in cutting $1.3 billion from the UN budget. "countries may not like what we do but they respect what we do. They know that if we say we're going to do something we follow it through." In a recap of her stint as UN ambassador, Haley praised Trump's decision to move the US embassy in Israelfrom Tel Aviv to Jerusalem, saying "we will put our embassy where we want to put our embassy." She also offered praise for other senior administration figures, including Jared and Ivanka, claiming that Jared was a "hidden genius" for his work on the revamped Nafta deal (now officially known as USMCA). Before leaving her position at the end of the year, Haley said she hopes to make sure "everything is in the right place" for when the next ambassador arrives. And while she "doesn't have anything set" on what she's doing next, she did confirm that "no I will not be running in 2020" adding that she's a "believer in term limits" and wants to give "someone else a shot." When reporters pressed her about her reasons for leaving, Haley denied that she was leaving for "personal reasons" and reiterated her claim that she felt it was time to "step aside" and that "the truth is I want to make sure this administration has the strongest person to fight." When reporters reverted to questioning Trump, the president said his administration had avoided serious foreign policy pitfalls - like the outbreak of a hot war with North Korea - that many of Trump's critics had warned would be all but inevitable should he set foot in the Oval Office. "Look at North Korea, it was a potentially devastating problem and now it's looking very good." "We are respected again - that I can tell you. Very much respected again. Even if you look at the votes in the United Nations - where we would normally get no votes we are getting very strong votes now." He added that the way in which Haley is leaving her position is "the right way to do it." "It's a great position - I think she's helped make it a much better position. I think it's become a more glamorous position than it was a few years ago. She's made it a more important position. So I can say we have very many people who want to do it and they are very good people." Trump also revealed that 'we're talking about three or four different locations' for the upcoming summit with North Korea, adding that he'd love to remove sanctions but that "we have to get something." "Eventually we'll have meetings on US soil and on their soil also." "I think North Korea is going to be a very economically successful country. Banks are calling they're wanting to go there...and that's one of the reasons we're having very successful conversations." Asked about the timeline for naming a successor to Haley, Trump said he expects to appoint someone within the next "two or three weeks." Asked about the missing Saudi journalist, Trump said he knows "nothing" about the situation but that he would be asking the Saudis for more information. Unable to restrain himself from taking a shot at his former rival Hillary Clinton, Trump answered a question about Hillary Clinton's warnings on how to handle Saudi Arabia with "I guess that's why she lost." Meanwhile, Trump said Pompeo's latest meeting with China (a meeting that ended in a dramatic public confrontation) went "very well." Turning to the often uncomfortable subject of the timing of a US-China trade deal, Trump insisted that "China wants to make a deal, but they're not ready yet. That's why I've canceled a couple of meetings." After a few more kind words for Haley, the president wrapped up the press conference. While Trump says he's sad to see Haley go, at least one person is excited by the news. Update (10:40 am ET): Trump has confirmed to a reporter that Haley will be leaving her post at the end of the year, saying only that she wants to "take a break" and that "we hate to lose her". The president reportedly said he will pick Haley's replacement in "two-three weeks" or "sooner." The president added that Haley told him 'six months ago' that she would be leaving at the two-year mark. Trump says Haley will leave the UN and administration at the end of the year but would be happy to have her back in any capacity, per @justinsink in the Oval. Trump says she told him 6 months ago that she wanted to leave at the 2-year mark. Haley confirms that she will depart on good terms and that she will campaign for Trump in 2020. Unsurprisingly, rumors are circulating in the White House press corp that the timing of Haley's resignation is "suspicious" and may have something to do with the Brett Kavanaugh controversy. Others are speculating that South Carolina Senator Lindsey Graham could soon take a job in the Trump cabinet (possibly attorney general?) after the midterms, allowing Haley to fill his old senate seat. In a statement to reporters, Haley said her experience as UN ambassador has been "the honor of a lifetime" and that the US would put its embassy where it wants and that "there are a number of people who would like to do this...it is a much more glamorous position than it was a few years ago." Two weeks after President Trump issued another fiery rebuke of globalism, the United Nations and its attendant institutions during his second speech before the UN General Assembly, Axios is reporting that the president has accepted the resignation of UN Ambassador Nikki Haley. Haley, the former governor of South Carolina who has been with the administration since the beginning, reportedly discussed her resignation with Trump during a visit to the White House last week. Her desire to leave her post apparently shocked several senior administration officials. Haley was an early and frequent critic of then-candidate Trump before she conceded and joined his administration. Haley refused to comment on reports of her resignation after walking by a group of reporters in the West Wing. But in what appeared to be a confirmation of the report, Press Secretary Sarah Huckabee Sanders announced that Haley would make an appearance with Trump in the Oval Office at 10:30 am ET. The event will be open to the press pool. Trump also teased the 10:30 meeting with a tweet. Most recently, Haley oversaw the US's withdrawal from a UN human rights council over its "chronic bias against Israel." "I want to make it crystal clear that this step is not a retreat from human rights commitments," Haley said at the time. "On the contrary, we take this step because our commitment does not allow us to remain a part of a hypocritical and self-serving organization that makes a mockery of human rights." At one point, Haley was rumored to be a top pick to replace Rex Tillerson as Secretary of State - a job that ultimately went to Secretary Mike Pompeo. Media reports detailed a fraught relationship between Haley and Tillerson as they jockeyed to be the face of the administration's foreign policy. Tillerson's aides reportedly asked her to pre-clear any public remarks with Washington. While she has mostly avoided conflict with Trump since joining the administration, Trump did accuse her of getting "ahead of the curve" after she said earlier this year that the administration would impose sanctions on Russian companies found to be aiding the Syrian government's chemical weapons program after a deadly chemical attack in April, as the New York Times reminds us. She also broke with the administration line when she said last December that women accusing Trump of sexual improprieties deserved "to be heard" and that "they should be dealt with." As Axios pointed out, Haley wrote an op-ed last month challenging allegations in the infamous anonymous NYT op-ed alleging that a group of senior administration officials had formed an internal "resistance" movement against Trump to protect the nation from his most dangerous impulses.